In this second of our two-parts series, Samir Mehta looks at the oligopolistic paints industry as an example of disruption risk and continual reinvestment to support future growth. In Asia, there is one difference when compared to developed markets. Good long-term growth opportunities for several companies are still robust, albeit frequently interrupted by macroeconomic challenges. Take India as a case in point. After disruptions due to demonetisation and the introduction of a GST, we now confront geopolitical tensions. I have no opinion of how this situation will resolve, but suffice to say that in the past, saner heads have prevailed. Results for the quarter ending December 2018 are almost through. Companies that managed the disruption of GST and demonetisation well were rewarded handsomely by the market; P/E multiples for the better-managed firms remain high. Take Asian Paints (AP) for example. On the face of it, the stock has always appeared expensive on both an earnings as well as price-to-sales multiples. In my opinion, there is a logical reason for this: the structure of the paint industry. The world over, the paints industry is an oligopoly. Even in America it has yet to be disrupted by the internet giants. In India, too, the industry is a cosy oligopoly, with AP the clear market leader. As of March 2018, total industry revenues were estimated at approximately Rs500bn (US$7bn), of which AP reported revenues of Rs166bn (US$2.3bn). The unorganised sector (small mum-and-dad chemical plants that have low-end paints with no brand resonance and poor distribution) still account for 30-35% of total sales. That share is likely to fall over the next decade, in my view. This will partly be driven by trends of rising incomes and aspirations of customers who gravitate to branded offerings, but moreso due to the introduction of the GST in 2017 and lowering the GST slab to 18% compared with 28% in prior years. The world over, the paints industry is an oligopoly. Even in America it has yet to be disrupted by the internet giants. 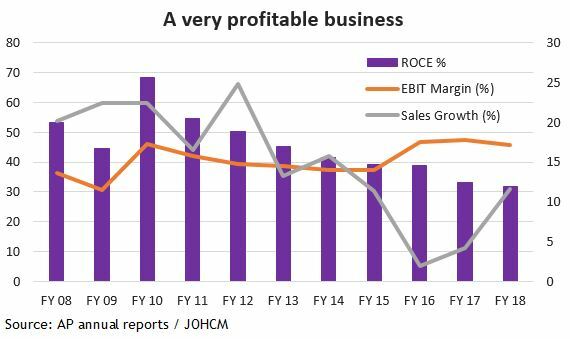 To illustrate the hold the four big companies AP (52,000 dealers), Berger (23,000), Kansai Nerolac (21,000) and Akzo (14,000) have on the market, it is instructive to look at the progress of a couple of firms that entered the industry early this century. Indigo Paints started in 2000 and Kamdhenu Paints opened in 2008. It is difficult to get exact data of these unlisted firms but, from public data sources, Indigo has approximately 12,000 dealers while Kamdhenu has 4,000. After 18 years in the business, sales for Indigo are approximately Rs5-6bn pa. To put that in perspective, the top four firms collectively spent Rs13bn in advertising and promotions in 2018. The cost of painting an apartment varies from 1-3% of the cost of purchasing the apartment. Paints are integral to decoration and aesthetics of the house. There is an umbilical link to the health of the real estate industry. In the past 7-8 years, home prices in India have, on average, remained flattish. A big bull market in property prices, which began in 2001/2, created an overhang of supply. Even in tough years, paint volumes have averaged growth of 6-8% pa. Fortunately in the past couple of years, the Indian government has refocused its efforts on the housing sector. Providing subsidised rates of interest for affordable housing, changing GST rates for finished and unfinished homes and recognising that building and construction industries can provide ample employment opportunities. The industry is working with the National Skills Development Corporation to impart skills in its effort to train painters and increase engagement with architects. Current penetration levels of paints in India is low. Housing demand in India is likely to grow steadily as income levels grow and joint families splinter over time. As the industry leader, AP is using its cash flows to create capacity well in advance of anticipated demand. 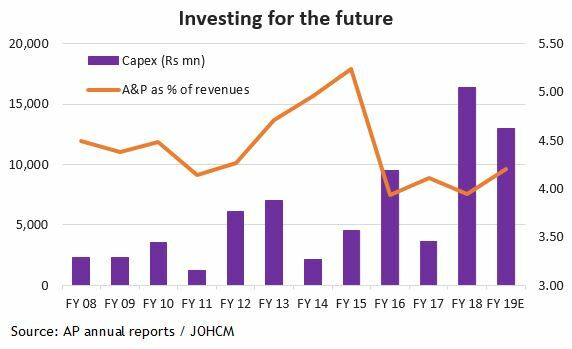 In the past five years, AP has invested Rs46bn in capex compared with just Rs20bn in the five years prior. Its A&P spend remains around 4% of sales, even on a much higher sales base.